Baculovirus-expressed recombinant fragment, corresponding to amino acids 3-105 of Human PPAR gamma 1+2. Our Abpromise guarantee covers the use of ab41928 in the following tested applications. Perform antigen retrieval by autoclave to preserve reproducibility. Sections should be fixed with formalin for no longer than 48 hours. A nuclear extraction is recommended. Receptor that binds peroxisome proliferators such as hypolipidemic drugs and fatty acids. Once activated by a ligand, the receptor binds to a promoter element in the gene for acyl-CoA oxidase and activates its transcription. It therefore controls the peroxisomal beta-oxidation pathway of fatty acids. Key regulator of adipocyte differentiation and glucose homeostasis. Note=Defects in PPARG can lead to type 2 insulin-resistant diabetes and hyptertension. PPARG mutations may be associated with colon cancer. Defects in PPARG may be associated with susceptibility to obesity (OBESITY) [MIM:601665]. It is a condition characterized by an increase of body weight beyond the limitation of skeletal and physical requirements, as the result of excessive accumulation of body fat. Defects in PPARG are the cause of familial partial lipodystrophy type 3 (FPLD3) [MIM:604367]. Familial partial lipodystrophies (FPLD) are a heterogeneous group of genetic disorders characterized by marked loss of subcutaneous (sc) fat from the extremities. Affected individuals show an increased preponderance of insulin resistance, diabetes mellitus and dyslipidemia. Genetic variations in PPARG can be associated with susceptibility to glioma type 1 (GLM1) [MIM:137800]. Gliomas are central nervous system neoplasms derived from glial cells and comprise astrocytomas, glioblastoma multiforme, oligodendrogliomas, and ependymomas. Note=Polymorphic PPARG alleles have been found to be significantly over-represented among a cohort of American patients with sporadic glioblastoma multiforme suggesting a possible contribution to disease susceptibility. ab41928 staining PPAR gamma 1+2 in rat adiposoe cells (10 ug/mL) by immunohistochemistry, formalin-fixed paraffin embedded sections. Two bands are visible: PPAR gamma 1 and PPAR gamma 2. Immunoprecipitation analysis using Fluorescence labeled PPAR gamma generated in vitro translation. Anti-PPAR gamma antibody (ab41928) is diluted with translation production and mixed with protein G Sepharose beads. It is then rotated at 4oC for 1 hour and precipitates are eluted with addition of SDS loading buffer. Samples are incubated for 10minutes at 70°C and analyzed with Fluorescence imager. ab41928 staining PPAR gamma 1+2 in rat plancenta(10 ug/mL) by immunohistochemistry, formalin-fixed paraffin embedded sections. Publishing research using ab41928? Please let us know so that we can cite the reference in this datasheet. 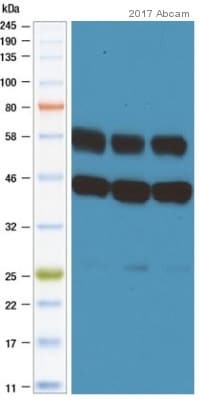 In the datasheet of this antibody you recommended for Western Blotting the use of nuclear extracts. Have you ever used cellular or tissue extracts with this antibody? Which dilutions and concentration of protein did you do to observe the protein PPAR-gamma? Proteins that are found exclusively or predominantly in a sub-cellular location can be enriched in a lysate of the sub-cellular fraction compared to whole cell or tissue lysates. This can be useful when trying to obtain a signal for a weakly-expressed protein. For instance, a nuclear protein will be a larger proportion of the total protein in a nuclear lysate than it will be in a whole-cell or whole-tissue lysate, making it possible to load more of the protein per gel lane. Another advantage is the removal of potentially cross-reactive proteins present in the unused fractions. For this particular antibody we recommend working with nuclear extracts to optimise the results. The buffer we would use for nuclear extraction is RIPA, but alternatively you could try the following protocol for nuclear fractionation: https://www.abcam.com/index.html?pageconfig=resource&rid=11408. We also sell sine Cell fractionation kits, which prepare cytosolic, mitochondrial and nuclear fractions in microplate format (see ab109718). I am afraid we don’t have any further information using this antibody with different conditions, but if you are unable to prepare nuclear lysates you could always try your cellular or tissue whole cell extracts and run a positive control in parallel. The recommended concentration for using this antibody in WB is 10ug/ml, but it is always advisable to optimise the method as it varies enormously depending on the conditions and samples used. Yes I would like to test the Antibody for PPAR-gamma ab41928 in Flow Cytometry. I am very pleased to hear you would like to accept our offer and test ab41928 in Flow Cytometry. This code will give you xxxxxxxxx off your next order before the expiration date. To redeem this offer, please submit an Abreview for Flow Cytometry and include this code in the “Additional Comments” section so we know the Abreview is for this promotion. Please remember that submission of the Abreview is sufficient for the discount code to become active. I am using human PBMCs and human bronchoalveolar cells and I am using flow cytometry for analysing the cells. Now I would like to expand my experiment and analyse PPAR-delta and PPAR-gamma in the same cells and I will use flow cytometry. 1- Which PPAR-delta Ab should I use? My suggestion is PPAR-A ab58137. 2- Can I use the same isotype? That is ab91366 Mouse IgG2b [PLPV219]? 4- Which PPAR-gamma Ab should I use? My suggestion is Ab41928. 5- Can I use the same isotype? That is ab91366 Mouse IgG2b [PLPV219]? I think ab58137 (www.abcam.com/ab58137) as you suggested would be the best antibody to try as it has been tested in flow cyt and using the same secondary ab (ab96879) would be fine. However you would have to use a mouse IgG1 as a control as the primary antibody (ab58137) has the isotype IgG1. I suggest isotype control antibody, mouse IgG1 [ICIGG1] ab91353 (www.abcam.com/ab91353). Regarding PPAR-gamma ab, we do not have any antibodies which have been tested in flow cytometry. However, if you would be willing to test one of these antibodies and providing us with your results, whether positive or negative, I could give you a discount. If you wish to test the antibody you suggested, ab41928, you could use the same secondary antibody but you would need a mouse IgG2a as a control. I suggest ab91361 as an isotype control (www.abcam.com/ab91361).